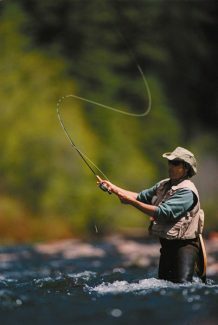 An angler tries his luck in the Gold Medal waters of the Fryingpan River outside of Basalt. “Unanimous approval. Can’t do much better than that,” said Sen. Don Coram, a Montrose Republican who sponsored the bill that would allow Colorado Parks and Wildlife to raise fees to support conservation programs and chip away at a $45 million maintenance backlog on 11 dams owned by the division. Parks and Wildlife last raised fees in 2005 and costs have soared since then. The division counts on hunting and fishing licenses for 60 percent of its roughly $150 million annual budget, none of which comes from the state’s taxpayer-filled general fund. While the cost of dam maintenance, fish food at 19 hatcheries, water leases and wildlife management have climbed and pressures on land and wildlife have grown with the increased population, the revenue the division takes in has remained stagnant. Since 2009, Colorado Parks and Wildlife has slashed $40 million from its budget and cut 50 jobs. The agency estimates a $22 million funding shortfall by 2023.